There is no place in the world with a more amenable year round climate for hiking, bicycling and horseback riding than San Diego County. Over the last twenty years development of regional trails in the County has begun to catch up to that potential with trail planning and building projects ongoing in five east/west corridors in the county bracketed between the California Coastal Trail on the West and the Pacific Crest Trail on the East. The San Dieguito River Park Coast-to-Crest Trail was a pioneer in regional trail building in the County when a Joint Powers Authority was formed in 1989 to conserve natural habitat and establish a regional trail in the San Dieguito River Valley between the ocean at Del Mar and Volcan Mountain, 55 miles to the east. Today, more than 34 miles of the trail have been completed across the northern portion of the county. To the north and south, similar efforts are underway in four other east/west trending river valleys that extend from the ocean to the mountains. The Escondido Creek Trail to the north, the Trans County Trail and The San Diego River Park Trail located in the middle of the County and the Otay Valley Regional Trail located at the southern end of the County are all in various stages of planning and construction. This progress establishing multi-regional east/west trails across the County has led to evolution of a larger vision for trails in San Diego County. That vision is to connect all five of the east/west regional trails with north/south links to form a matrix of regional trails over the entire county. If that can be accomplished each of the many local community trail systems which now exist in isolation can be linked to a Countywide regional trail system allowing trail travel opportunities starting from neighborhoods and radiating across the entire length and breadth of the County. Now, the first step toward connecting the east/west trails with north/south links has been accomplished. 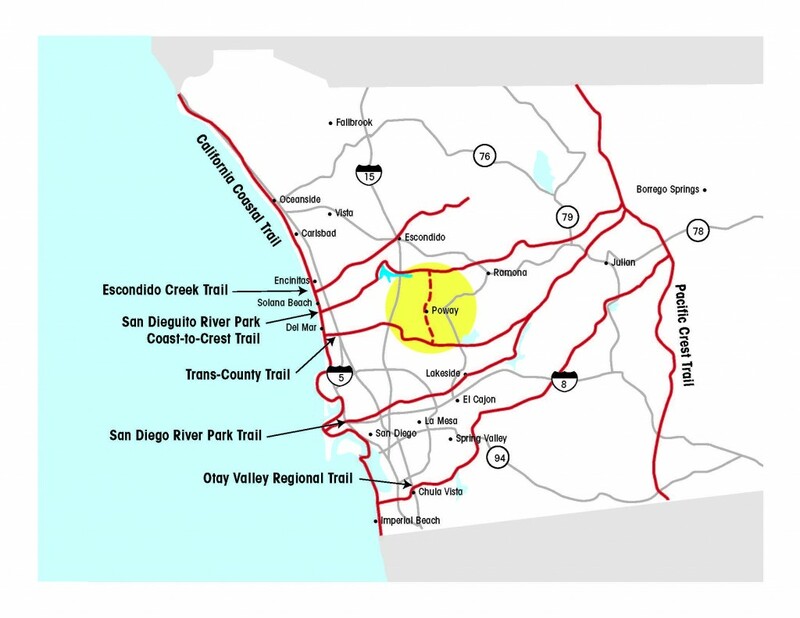 The San Dieguito River Park, in cooperation with the City of Poway, has established a north/south trail linkage between the San Dieguito River Park Coast-to-Crest Trail and the Trans County Trail through the City of Poway Trail system. 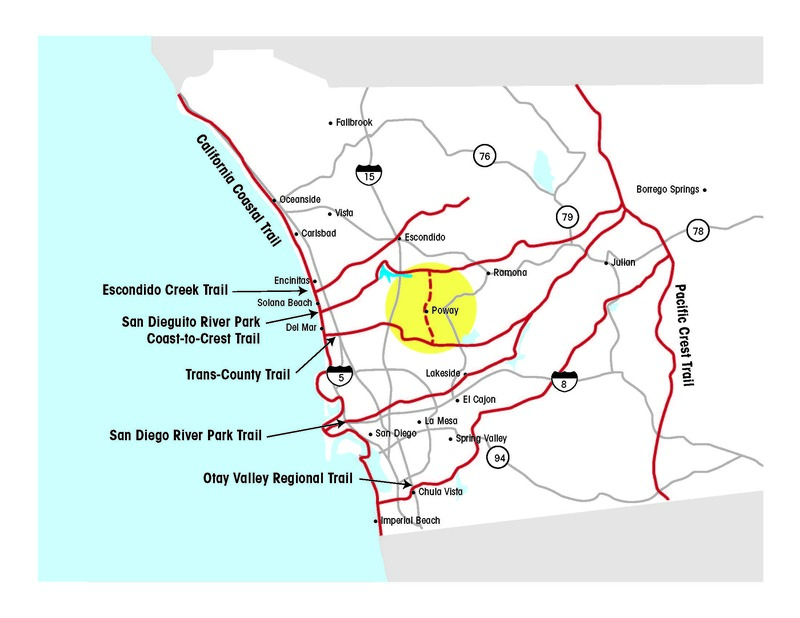 The new linkage, highlighted on the map within a yellow circle, almost doubles the length of continuous regional trail system available to trail users by joining the 23 continuous existing miles of the San Dieguito River Park system to the 14 miles of the Trans-County system through 8 miles of the Poway Trail system. This regional trail backbone overlays the City of Poway neighborhood trail system which includes 55 miles of linked trails providing regional trail access to most of the city’s 50,000 residents. When all of the regional east/west trail systems are completed and linked with north/south connections, County residents and visitors will enjoy a connected county-wide regional trail system of over 300 miles that will constitute an alternative transportation system. Residents will then have a practical alternative to adding their cars to crowded highways for work, school, or shopping trips and the natural climate advantage of San Diego County will be put to good use helping solve transportation and health issues in addition to providing a superb recreation resource for residents and visitors to San Diego County.